Discussing the fusion of contemporary pop-culture and beautiful creativity, with no idea what we’re talking about. #31. On Game Of Thrones S6, And Beyond! How is it over already? Game of Thrones just threw the biggest season finale of the entire series, and it was awesome! But we've now got to wait a year to see more. Tom and Sean join up with Jason from LAMBcast (Find them on iTunes here) to talk about the highs and lows of arguably the most impressive season so far! WE'RE BACK! It's been a while, fellas, but we won't leave you again - we promise! James and Tom went to see Captain America 3: Civil War, so you don't have to - but you totally should. Trust us! #28. Superhero Catchup! Batman v Superman, Daredevil s2, Civil War and Doctor Strange HYPE! It's been a while since we had a good comic movie / TV catch-up, and it's been a pretty wild ride lately! Join Tom and Sean as we chat about the good and the bad of Superman v Batman, how awesome the Punisher was in Daredevil Season 2, as well as the extreme hype we're feeling for Civil War (more on that later this week) and this winter's mystical outing with Doctor Strange! Episode 27 | Interview With Kyle Rowley, Quantum Break Lead Designer! We've been away for a couple of weeks, but now we can make it up to you - Tom and Marcos have had a great long chat with Kyle Rowley, lead designer at Remedy Games. You might recognise the Remedy name, as they're responsible for creating Max Payne and Alan Wake, and their big new game Quantum Break has just launched this week! Hopefully you're playing it right now! Listen as Kyle talks about how he broke into the games industry, tells us a little about the game, and we ask him all about other goings-on in videogames this year. It's a corker, so press play! Episode 26 | Tech Catch-Up! Apple Vs FBI, VR Pricing Revealed and Sony’s Rumoured 4K PS4! Woah, that's a lot of acronyms. 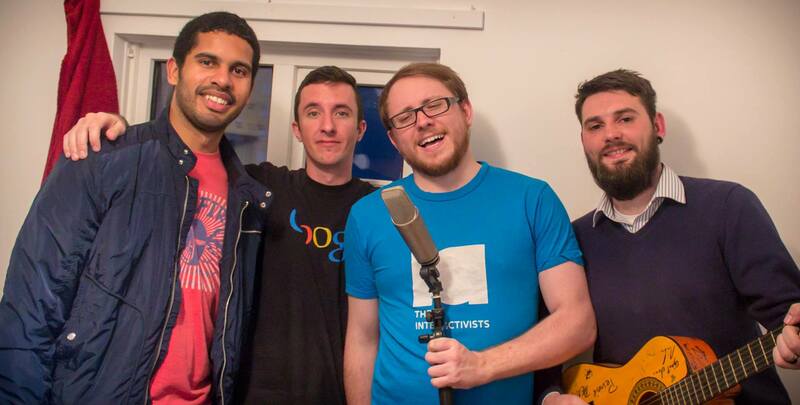 Welcome back to the Interactivists podcast! Join Tom and Marcos as we talk about all the latest tech news and get our heads around the Apple Vs FBI wrangle that's happening right now. One day, we'll probably not talk about VR - but that is not today. Have anything to add to this podcast? Search Interactivists on Facebook and Twitter and say hey! Episode 25 | Gaming Catch Up! On Firewatch, XCOM 2, Uncharted 4 and more! Hey Interactivists! It's been a while since we all got together to have a jolly old chat about our favourite hobby - videogames! Join James and Tom as we talk about Firewatch, Superhot, PlayStation Now and more! Follow us on Twitter @interactivists - we'd love to hear from you! Episode 24 | Celebrating 20 Years of Pokemon with Serebii.net! It's not every day we get a bona-fide internet celebrity on the show, but this week we have Joe, owner of Serebii.net - the biggest and best Pokemon website on the internet, to sit down with Tom, Jim and 100XP's James to answer some of our questions! Pokemon is 20 years old on Saturday 27th of Feb 2016! This episode, we celebrate and talk about the games, the TV show and the future of the tiny little monsters that could! So, Deadpool's out! You should see it. I know you're sick and tired of Deadpool content by now, so just see it. Go watch it. See it. Right now. OK? Also, there be spoilers in this podcast! Are you an Apple or Google guy or gal? It's something everybody falls down on one side or the other, but why can't we all get along? With the earnings being released from both companies, Google just peaked above Apple in market cap valuation, and the internet went crazy. Copyright Thomas Wood 2015. All rights reserved.